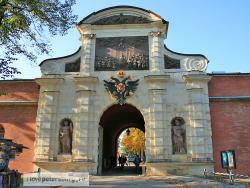 Until 1740 the St. Peter Gate was the main entrance to the Peter and Paul Fortress. First, the wooden gates were erected in 1708 by the architect Domenico Тгеsini. Over the gates there was a bas-relief “The overthrow of Simon the Magic”. This bas-relief was created by Niccolo Pineau and Konrad Osner. Simon ascened to the sky by his magic force. But he was deprived of his magic force and overthrown to the earth by Apostle Peter’s prayers. This bas-relief allegorically presented Russia’s success in the North­ern War. Over the arch a two-headed eagle is fixed. The two-headed eagle was the coat of arms of the Rus­sian Empire. The two-headed eagle on the coat of arms of ancient Rome symbolized the equal status of Rome and Constantinople. Rome and Constantinople were the two capitals of the Roman Empire. Before the end of the 15th century there was no single state coat of arms in Russia. The two-headed eagle appeared in Russia by 1497. The Grand Prince Ivan III believed that Moscow was fated to take upon itself the splendor and mag­nificence of the fallen Bizantium. Inthe bays at the both sides of the gates, two alle­gorical figures are installed. These figures personify state wisdom. In 1718. Domenico Tresini reconstructed the gates in stone. He repeated the original idea, preserving Osner and Pineau’s bas-relief and carved decorations. The St. Peter Gate is a great architectural monu­ment of the 18th century. And this is also historical monument that has come down to us almost unchanged.